The cylindrical conical rounder is ideal for rounding both soft and medium doughs. Rounding is achieved by a rotating cone, which rotates the dough along concave channels to produce roundly shaped dough. The machine can be equipped with a hot/cold air blowing system or/and oiling system, to prevent dough sticking. 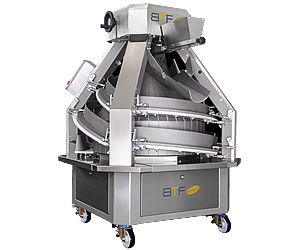 The machine is equipped with an automatic flour duster, which is easy removed for cleaning. The channels are Teflon coated to prevent the dough from sticking. Cone have variable speed.